Published: Jan. 7, 2019 at 08:02 p.m. Updated: Jan. 8, 2019 at 01:35 a.m. The Clemson Tigers secured their second national college football title in three seasons in dominant fashion on Monday night, rolling the defending champion Alabama Crimson Tide, 44-16, in the College Football Playoff Championship Game in Santa Clara, Calif. Led by true freshman quarterback Trevor Lawrence, the Tigers scored 30 unanswered points on Alabama in the second and third quarter to pull away. Here are the best plays, moments and sights from the game. Alabama Crimson Tide head coach Nick Saban walks to the field. Saban has won six national championships: LSU 2003; Alabama 2009, 2011, 2012, 2015, 2017. Clemson head coach Dabo Swinney leads the team in a pregame huddle. Swinney is looking for his second national championship after leading the Tigers 35-13 to the title over Alabama in 2016. Clemson defeated Notre Dame 30-3 in the Cotton Bowl on December, 29, 2018 to advance. Alabama Crimson Tide quarterback Tua Tagovailoa (13) throws the ball during warmups. Tagovailoa finished second in the Heisman voting behind Oklahoma QB Kyler Murray. Tagovailoa beat Kyler Murray and Oklahoma in the semifinal 45-34 in the 2018 Orange Bowl on December 29, 2018 to advance to the championship. A member of the Clemson Tiger Twirlers performs with the band. Alabama Crimson Tide head coach Nick Saban and players run onto the field. Andy Grammer sings the national anthem. Clemson's A.J. Terrell intercepts a pass runs it back 42 yards for the game's first score. Alabama's Jerry Jeudy catches a 62-yard touchdown pass in front of Clemson's Tanner Muse. Alabama's quarterback Tua Tagovailoa (13) and running back Josh Jacobs (8) celebrate after throwing a 62-yard touchdown pass to Alabama wide receiver Jerry Jeudy. Clemson Tigers wide receiver Tee Higgins (5) catches the ball for a 62-yard gain on third down in front of Alabama Crimson Tide defensive back Saivion Smith (4). Clemson Tigers running back Travis Etienne (9) runs for a 17-yard touchdown. Alabama Crimson Tide running back Najee Harris (22) reaches for the end zone but after a booth review is ruled to be down at the one-yard line. Alabama Crimson Tide tight end Hale Hentges (84) is congratulated after catching a touchdown pass. Alabama missed the extra point. Clemson's Tavien Feaster runs with the ball for a 26-yard gain. Clemson Tigers running back Travis Etienne (9) scores touchdown on a one-yard carry. Clemson Tigers cornerback Trayvon Mullen (1) intercepts a pass for Alabama Crimson Tide quarterback Tua Tagovailoa's (not pictured) second interception of the game. Tagovailoa threw two picks in the SEC Championship game against Georgia. Clemson Tigers running back Travis Etienne (9) sores his second touchdown of the game. Clemson Tigers cornerback Trayvon Mullen (1) sacks and knocks the ball loose from Alabama Crimson Tide quarterback Tua Tagovailoa (13). Alabama recovered the ball. Clemson Tigers quarterback Trevor Lawrence halftime stats: 12 for 21 for 197 yards and one touchdown. Houston Texans' Deshaun Watson (left) and DeAndre Hopkins attend the game. Watson won the national championship as a Clemson Tiger in 2016. Hopkins attended Clemson from 2010-12. Clemson's Justyn Ross celebrates his 74-yard touchdown catch. Clemson's Justyn Ross makes a one-handed catch in front of Alabama's Josh Jobe. Clemson's Tee Higgins catches a 5-yard touchdown. 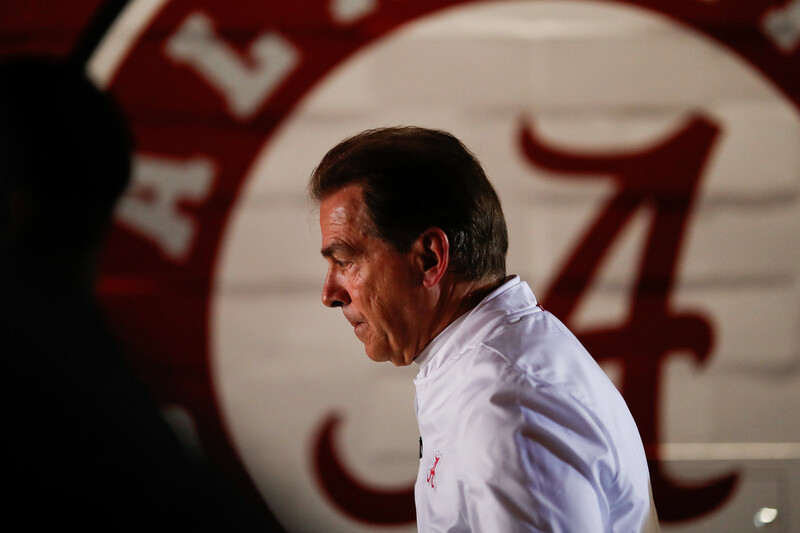 Alabama is facing the largest deficit ever under Nick Saban. Alabama Crimson Tide quarterback Tua Tagovailoa (13) is stopped by Clemson Tigers defensive end Clelin Ferrell (99) on fourth and goal for a seven yard loss. Clemson Tigers head coach Dabo Swinney kisses the championship trophy. Swinney now has defeated Alabama Crimson Tide twice in the championship game. Clemson's Trevor Lawrence celebrates the victory. Lawrence, a freshman, finished 20 for 32 for 347 yards and three touchdowns and named the game's offensive MVP. Clemson players celebrate defeating the Alabama Crimson Tide for their second National Championship in three years. Clemson's Christian Wilkins celebrates after defeating the Alabama Crimson Tide. Read more about Christian Wilkins. Clemson Tigers wide receiver Amari Rodgers (3) celebrates with Houston Texans wide receiver DeAndre Hopkins.